Joe Koelsch is the Dean of Instruction at KIPP Memphis Academy Middle. Before that, he taught math for 6 years. The message is simple, and I hear it from both parents and teachers—even some math teachers—every day: why is math so much harder now than it was when I went to school? In the next few paragraphs I hope to answer that question using the example from the video… so if you haven’t watched it yet, take a few minutes now. 1. Multiply both numbers in the top number by the first digit in the bottom number. 3. 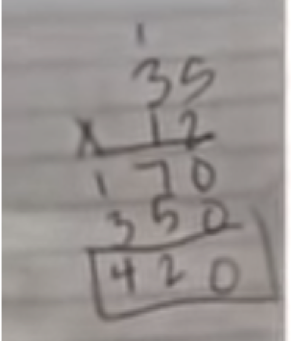 Multiply both numbers in the top number by the second digit in the bottom number. 4. Add the two answers together to find your solution. 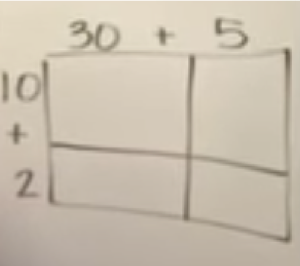 These simple steps can be used to answer any 2-digit by 2-digit multiplication problem. It’s easy to teach, to learn and to replicate. Unfortunately, most of these benefits rely on the same faulty foundation: that doing math is about repeating a process to quickly find an answer. It is this thinking that has created generations of uninspired and bored math students and teachers, and has left the United States ranked 38th out of 71 countries assessed in a recent international math assessment (http://www.pewresearch.org/fact-tank/2017/02/15/u-s-students-internationally-math-science/). So, what about this “new math” is different? For one, it is built on the belief that students should have a deep understanding of WHY they are doing what they are doing, before they worry about solving problems. In the example above, most students (and adults) have no idea why they are multiplying both digits in the top number by the first and second number separately—much less why they’re adding a 0. Without this understanding math is simply a game of memorization, which rewards students for quick and accurate repetition, not deep thinking. This has left generations students saying they are not “math people” simply because they don’t work quickly. Another belief on which common core math is built is that math is all connected. While the standard way of completing a multiplication problem is really only applicable to…well… multiplication problems, the area model links arithmetic to geometry and later on to algebra as students learn about the distributive property and polynomial multiplication. By making these connections explicit, students can begin to see that math is not a complex series of processes to be memories and applied as quickly as possible, but rather a simple system of a few basic truths that can help us to better understand the patterns that exist all throughout our world.